It's time to resurrect the Travel Photo of the Month. A monthly selection of my favourite photos from travelling the globe. Some are many years old converted from film to digital and are still amongst my favourites. 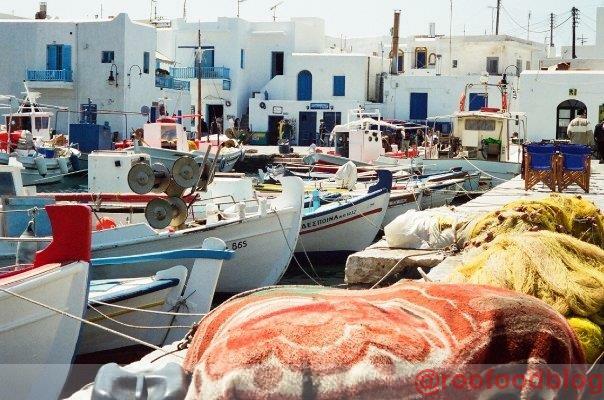 In light of what is going on in Greece at the moment, I have reflected back on my 5 weeks of travelling the Cyclades Isles ack in 2000 (just before moving to Ireland). We had quite the adventure! It may not have started off as planned (I have since learnt to read 24 hour time correctly!) and the entire trip continued to be full of misadventure, disaster, injuries, stupidity, some begging for food, sickness amongst alot of partying and fun. I can only look back on these days and think 'how the hell did we survive that trip?' We really did get up to some mischief. Here were were exploring a tiny fishing village in Paros and loved all the fishing nets nestled around an old rustic dock. The smell of briny fish and bait and sea salt tinged air with the warmth of the sun was blisful, while sitting back and sipping on a cold beer and a plate of BBQ octopus, watching the fisherman bring in their catch of the day.